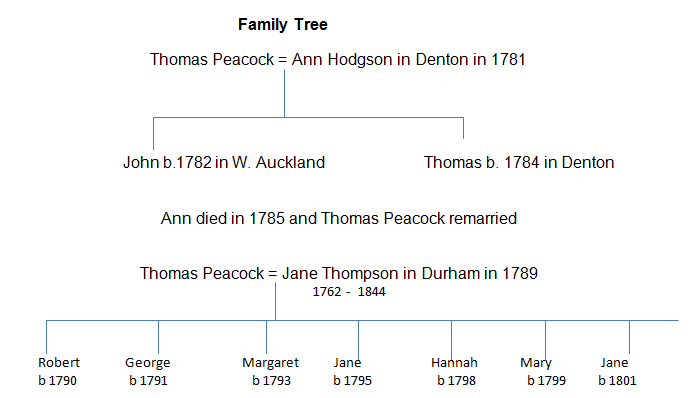 Thomas Peacock was born in Cumberland around 1755. He had a long association with Escomb from the later years of the 18th century until the 1840s. He is recorded as being the perpetual curate for 50 years of the parish of Denton, outside Darlington, and leased Thornton Hall there for some years. Thornton Hall now manages a splendid garden which is open to the public on selected days over the summer months. Perpetual curacies These became common in the 19th century when a great increase in population required new churches to be built and new parishes established, particularly in urban areas. Rather than changing complicated ecclesiastical rights around tithes and glebe lands, former chapelries were elevated to the status of parishes, their incumbents being named Perpetual Curates rather than Rectors. This term gradually died out and had disappeared by 1868. George became a leading Mathematician at Trinity College, Cambridge, where he was Professor of Astronomy and a fellow of the Royal Society. He later became Dean of Ely. Margaret married the leading Durham historian James Raine, who founded the Surtees Society, and they lived for many years in Crook Hall, Durham. When James Raine died in 1858, Margaret moved in with her unmarried sister, Hannah, in Old Elvet. Margaret died in 1874. The Newcastle Chronicle of November 1889 records the death of Hannah, aged 92, the last surviving daughter of Thomas and Jane Peacock. She spent her last years in Gateshead. Thomas Peacock appears to have a long association with Escomb. He may well have lived there as at the beginning of the 19th century many incumbents, as many as 50%, did not live in their own parishes. We know that for some years he ran a small school in Denton. 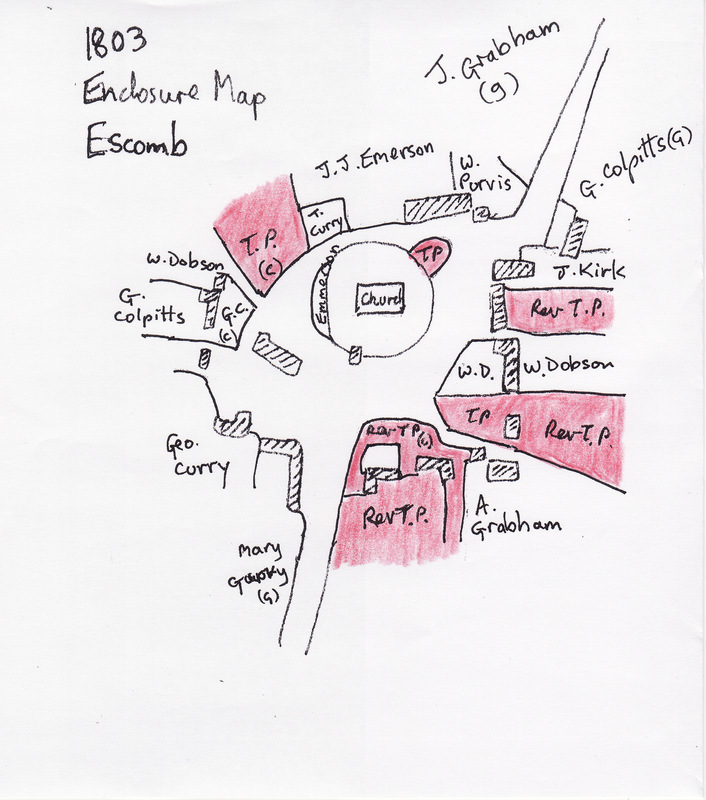 The Enclosure Map of Escomb 1803 (appendix 1) shows that Thomas Peacock owned 11 different parcels of land in Escomb parish, which then included the area of Witton Park. 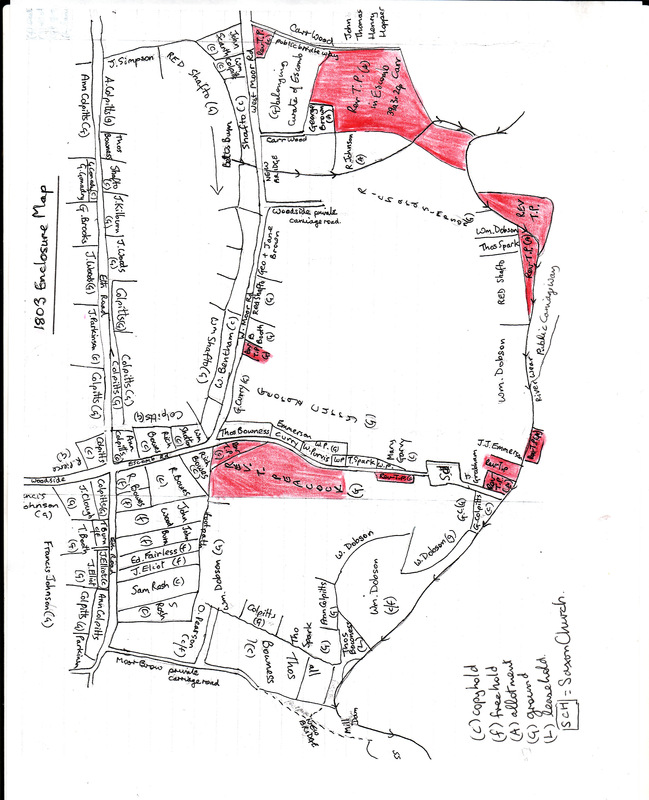 As the enlarged section of the Enclosure map shows he also had 7 of the 24 properties around the Saxon church itself. A document of 1808 (appendix 2) shows a plan of Escomb church and which families paid for the repair of pews in the church for 12s 6d. The Peacock family paid for 3 pews, No. 3 on the North side and No.s 8 and 9 on the South side. In 1813 he is recorded as a farmer in Escomb, and after 1821 as a Gentleman. The 1823 and 1831 records of the Overseers of the Poor show 22 recipients of poor relief in the village. Thomas Peacock was a regular contributor and he is listed as a proprietor in the village, with tenants. In 1832 and 1840 Thomas Peacock is listed as leasing land from the Bishop’s estate. He also leased land in Bondgate, in Bishop Auckland, in 1847. 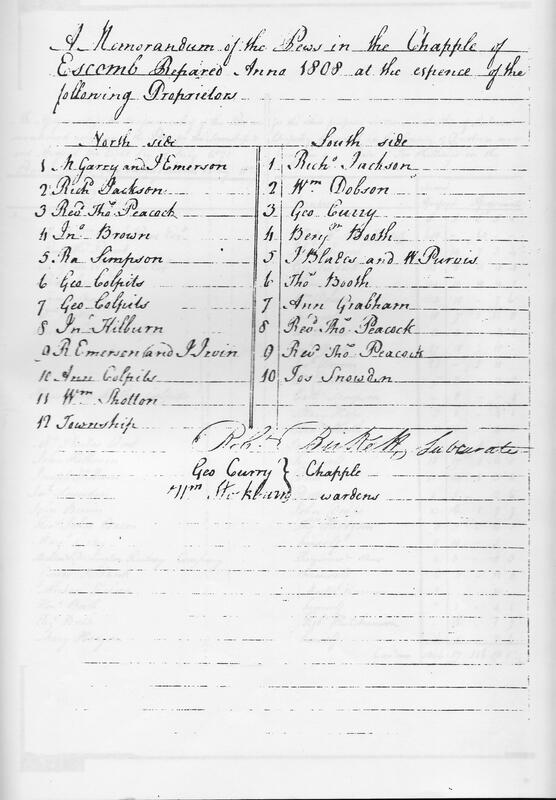 The 1841 census lists Thomas Peacock as still resident in Escomb. Thomas Peacock was active in the area in other ways. In 1794 settlement of property in High Coniscliffe is recorded. The right to the tithes in Escomb was acquired by two groups; In one part Elizabeth Robson, George Crawford, Thomas and Dorothy Bowes; and in the other part George Culley and the Revd. Thomas Peacock. Ref D/Bo/F29. In 1821 John Allen, Thomas Scarth and the Revd Thomas Peacock were appointed as official collectors of subscriptions towards the Stockton and Darlington Railway. Their appointment was approved by Gerald B Wharton of Lincolns Inn Field in London. This was announced in the Durham Advertiser and the Norwich Mercury. He died on Saturday 27th September 1851in Norfolk, where he had been the Rector of Tuddenham for the last few years of his life. He was either 97 or “in his 96th year”. The Norwich newspaper lists his property that was put up for auction. As well as a range of furniture and table wear there was an American clock, a Chestnut pony of 13 hands, a cab shaped pony gig and harness and an invalid’s chair !